Katarzyna Lidia is a great enthusiast and instructor of ATS®, FCBD® Sister Studio, artistic director of The Siren Project and author of Movement Dialect with flamenco fan. Katarzyna in 2012 received her General Skills Certification in Dillenburg, in 2014 the Teacher Training Certification in Rochstock (London) and in 2015 the Sister Studio Continuing Education Re-Certification. She participates in workshops and festivals in whole Europe and learned from the most important ATS® teachers: Carolena Nericcio, Megha Gavin, Wendy Allen, Kristine Adams, Kae Montgomery, Anita Lalwani, Devi Mamak, Philippa Moirai. She is devoted to Devi Mamak Movement Dialect and improve their dance by taking flamenco class. She likes to emphasize the flamenco background in ATS®. Because of that she creates the Movement Dialect with flamenco fan, which she is developing in The Siren Project. She also appreciates ATS® in it’s pure form. Her motherly tribe is Ouled Nail from Poznan. Since 2012 she is also a part of The Siren Society from Warsaw where she has pleasure to dance with another FCBD® Sister Studio Agata Zakrzewska. 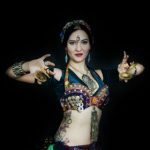 She teaches ATS® in FCBD® format in two schools: Hamsa Dance School which is greatest school in Warsaw dedicated to diverse oriental styles and in small Rytmosfera which is a part of Studio Flamenco. Since 2016 she has taught also abroad: Sommerfrishe in Offenbach (2016, 2017), Tribal Weekend in Kiev (2016), Roma Tribal Meeting (2017), Tribabridge in China (2017), 200%ATS® Italy (2018).